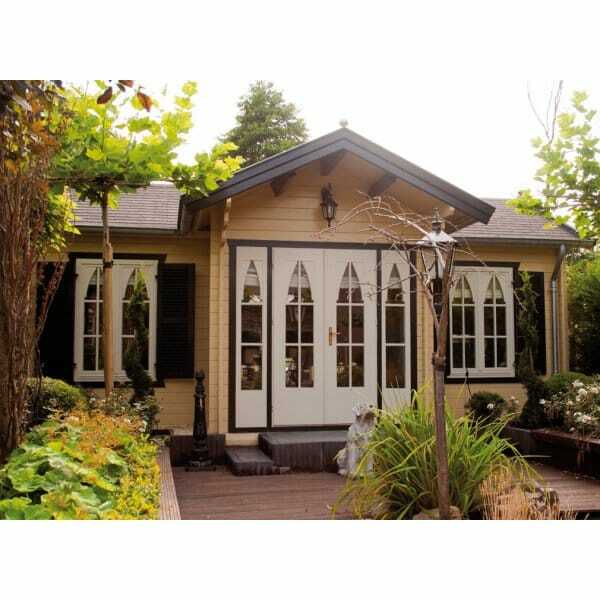 Bertsch Leisure Log Cabin: The Bertsch Leisure 736cm x 551cm is a charming building with spacious floor area of 31m² consisting of a L shaped living area and a secondary area of similar size. The two sets of double doors and six windows make this a light and airy living space. This building would make a lovely garden house or garden office log cabins. Please Remember: All Log Cabins in the Bertsch Range can be altered to suit your garden. Please call for more details. Please Note: The tops of the Glazed areas of the Windows and Doors are finished flat ie the glass is rectangular and NOT as shown in image above. Footprint: 5.51m x 7.36 Leisure Log Cabin PLUS Canopy of 1.0m + Total 7.51m x 7.36m1 x Mezzanine Floor: 3.71m x 2.41m 2 x Main Room (3.71m x 2.41m) each with an additional room.